The plans are coming together. We’ve begged and borrowed everything needed, from air mattresses, to a camper shell for the truck. But, wait. I’m ahead of myself. We have been practicing pitching the tent. Did I tell you we are taking the truck? It has few enough miles that it’s still in good shape but old enough and with enough dings (read hail damage and a few experiences with a teenage daughter) that we won’t cry if we drive over rough road and find rocks. The always safety conscience husband has insisted we change the oil, check the windshield wipers and other lame stuff that should be unnecessary to look at for the life of the vehicle. And my folks are letting us use their camper shell so everything can stay dry and we can pack more stuff. 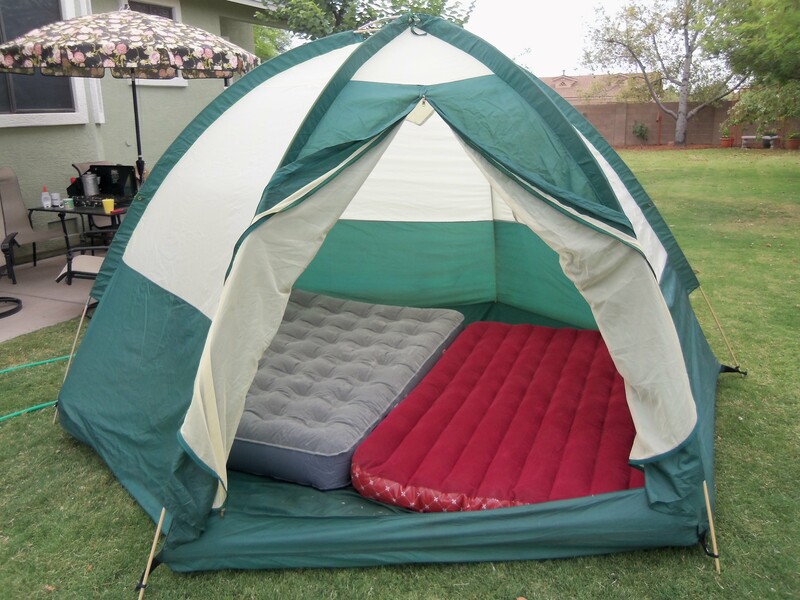 Yes, more stuff… because my idea of just tenting occasionally has grown into camping as long as the weather permits. We’ll also be cooking most meals, which makes sense when you think about Matthew’s dietary restrictions this way we’ll be able to eat pretty much like at home. The folks also loaned us a ’30 second tent’ which pops up in just 30 seconds and they had a port-a-potty which will be put into the 30 second tent… Thus solving the significant “peeing behind the bushes” dilemma. 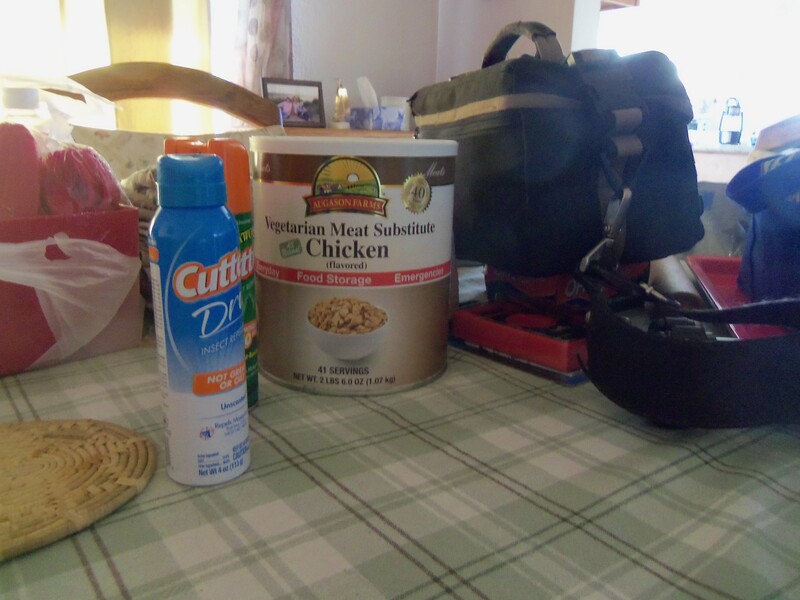 Key items ready to be packed include OFF (of course), the dried fake chicken chunks, and hey, note the prized camera bag loaned to me by my photo journalist mother! 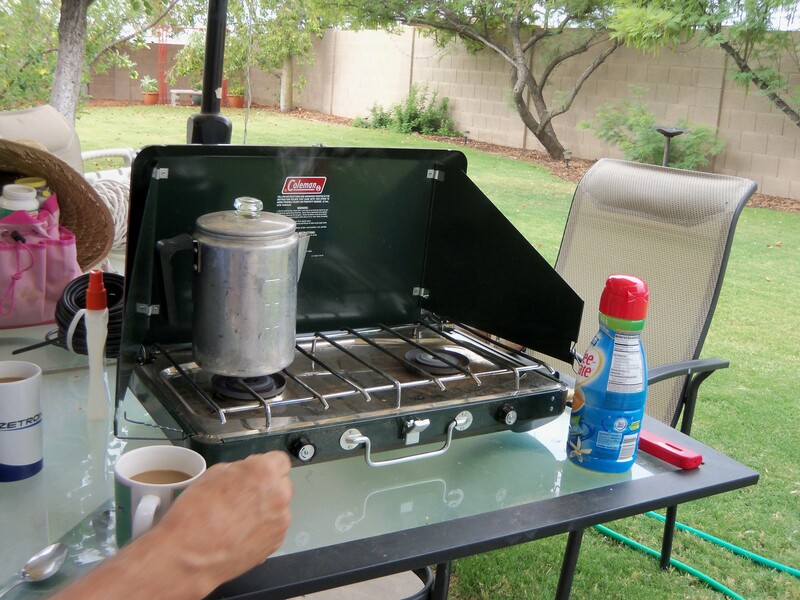 Not only do we have to learn how to cook on the Coleman stove, but how to percolate coffee. So the plans are all coming together. We’ve mapped out our route and will see friends and family along the way. The length of the trip is daunting and we’ve already had to make cuts in some of the more frivolous stops along the way. (The good thing is, we will have places to visit the next time…) The kids are excited. None of us can really know what to expect. There will be lots of family time. Often when I tell Matthew we are going to do this or that he stomps around in protest. But he is surprisingly interested in the trip. Of course, as you may recall, he loves the maps and continues to peruse them daily. We talk about the people and things we will see and I know there are several special people along the way that he is excited about seeing. Due to concerns about the safety of our cats…and our cat sitter…I made an executive decision to post updates on a delay. Burglars and thieves should note that as they read about our expedition chances are very high that I will be sitting in the living room, upholding my second amendment rights, polishing my Colt 45. So the questions will be: Is it real? Or is it Memorex? Am I reading something that happened today? Or was it three weeks ago??? Okay, I’ll give you a few clues…the seasoned adult or keen observer, who has read beyond junior high Social Studies will be probably ferret out the truth. Today it is 99F here in the Arizona desert and the temperature will only go up for the next month. Rain…or snow…we are looking forward to spending time in the cooler climes and experiencing the land of the Midnight Sun. 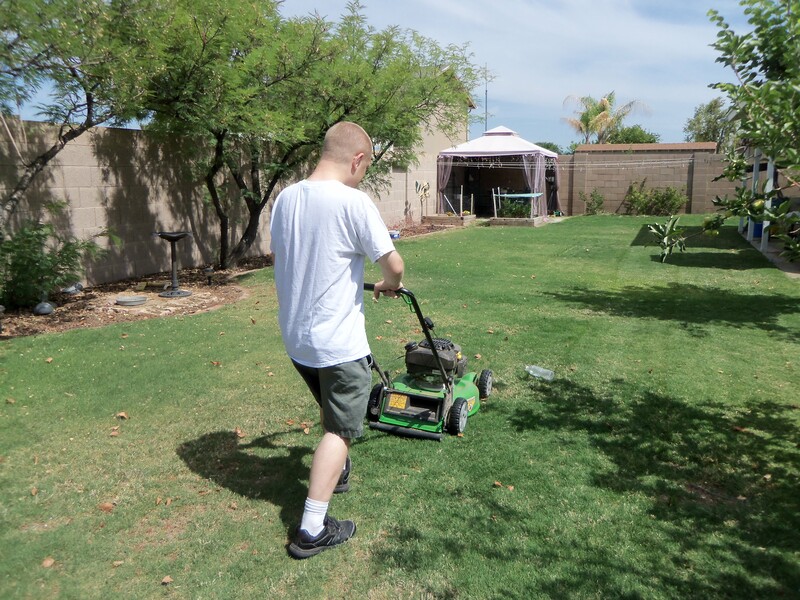 This week Matthew decided he should mow the lawn. Will wonders never cease? Sometimes we parents with special needs children go along and don’t realize how different our lives are. I was reminded recently when Rebecca mentioned to some of her friends that she was caring for a special needs girl. She told her fellow students that working as a caregiver was a very good part time job that she could continue to do while in med school and recommended it for those looking for work. But they were hesitant; they had never been around someone with special needs; they didn’t know if they could do the job. Rebecca was surprised but that’s because being around someone with different needs has always been part of her life. So today I am sharing just a couple incidents that might help you better understand the uniqueness of life at our house. Everybody likes to go to the movies. Right? So does Matthew. But with two distinct differences. The first, you might expect because he has difficulty sharing emotions, is that we do not go to movies that are too intense. Poor Matthew gets so caught up in the movie that if the good guy’s life seems in peril Matthew feels it deep in his soul and doesn’t know how to handle the fear and worry. We always try to have someone preview the movie first. The second thing is actually pretty crazy. There are many movies Matthew doesn’t care to see. But when he decides on one, well that’s the one we have to see first. He doesn’t want to hear about another movie, even though he might like it just as much. It’s first things first. Always. Last year he decided he wanted to see the dumb Smurf movie. And that was it. Even though there were many better movies that he would have liked we had to wait for the Smurfs…which didn’t come out until August. Bob and I were sitting at the kitchen table talking about nothing important, Matthew was on his computer and the television was on, maybe Matlock or a commercial. I wasn’t really paying attention. But suddenly, Matthew leaps up from his chair and runs over behind the couch looking directly at the TV. He held a postcard from a steamboat ride we had taken in his hand. He raised his hands up as though he were going to lead the benediction at church and stood there frozen, arms outstretched for nearly a minute. Finally, he pointed the postcard towards the TV, as if to show either the television or maybe Andy Griffith or the boat on the postcard something. And then walked back to his computer as if nothing had happened. Yesterday, I was walking on the treadmill while Matthew was watching something on TV when a commercial came on. (Commercials are usually his time to find a drink or chips or just generally wander around because they don’t hold his interest.) But this time he jumped up and ran over to the fireplace. 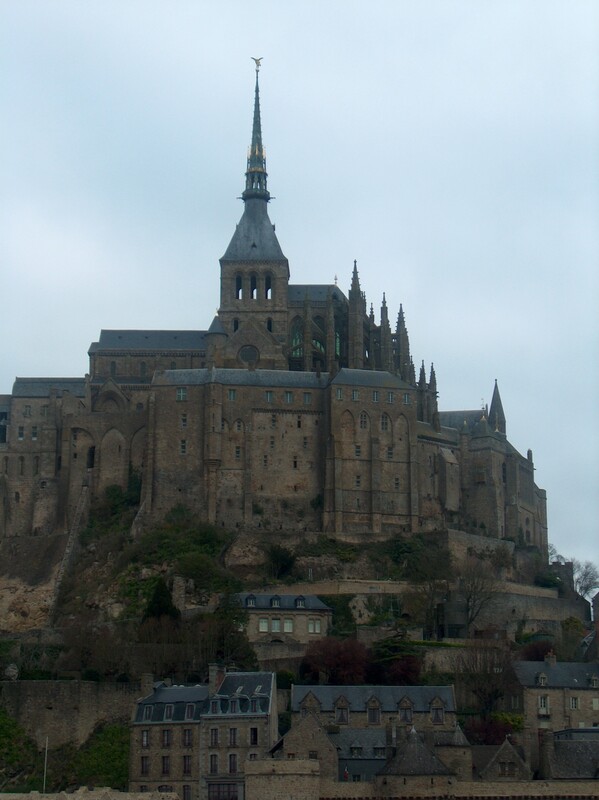 He looked up at the photo of Mont St. Michel and raised his hand up toward the sky with finger pointing. Something like a ‘We’re number one’ pose. He stood there again for a few seconds then went and sat back on the couch. He has never done either of these things. There was a distinct point to his movements but what? We might eventually figure it out. Or not. Enough for today. I’ve rambled on enough and we’re all good here now–as long as we don’t mention the m o v i e . . .
Oh, and by the way, if your child talks and communicates with you, good or bad, you are fortunate. Just think of me the next time he gives you the ‘What For?’ business and give him a hug. There we were, minding our own business, driving across the parched Arizona desert. We were stopped for gas mid-trip when a man walked up and began talking to a guy in the car next to us. Being nosy we listened in. Being clever, Mom asked questions. We learned a loaded semi-truck had been involved in a serious accident just down the road. The trailer and its cargo were damaged allowing the insurance company to let people freely have its contents. The man was telling locals but after a short discussion we decided we were local enough and hollered to Grandpa to get in and sped down the road, like speed demons, well, because of…The Prize. Sure enough, when we arrived, even though it was a hot day, there were people crowded around the trailer, hands outstretched, waiting, hoping. We jumped out of the truck and raced over thinking, “This could be it. Maybe we’ll be the lucky ones.” In the crowd several women were speaking excitedly in Spanish but every so often I could hear them mention…The Prize. Accordingly, I inched my way forward. Hands out, we all looked like paupers waiting for our daily rations. I’m pretty sure Mom was wielding her cane like a Jedi Knight with his sword because the seas parted, making room for me to reach the front. There, for the first time in my life, I was tallest, and when the box came forward I snatched it quickly and headed back with…The Prize. I called Bob immediately and sent him a picture. As you might expect, he too was excited. Oh, you don’t know why? Yep. It was a produce truck. 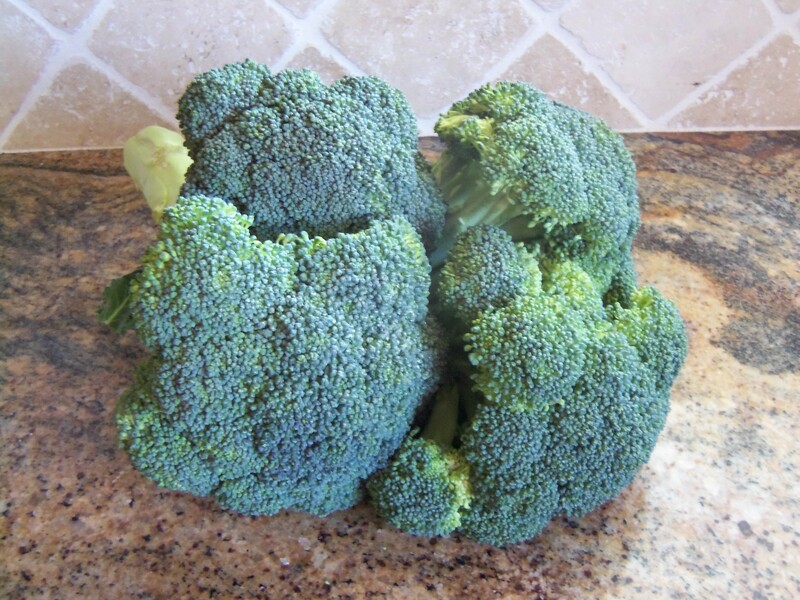 And we got a case of broccoli!